The only drawbacks I found are that the charts can get a little crowded, data points cross the outer border and get cut off, and if there’s a way to label the axes, I can’t figure it out. But, hey, it’s an early version of an open source project (from the DensityDesign lab of the design department at Politecnico di Milano), so there are still kinks to be worked out. Anyhow, I have football on my mind for some reason (even though I’m not that big a fan), so I thought I’d visualize some NFL quarterback data. I initially copied and pasted the statistics from a webpage showing them — and it worked just fine — but then I realized I also wanted to sort players by division, so I pasted the data into into Excel, added a column and then repasted into Raw. Here’s one chart I came up with. 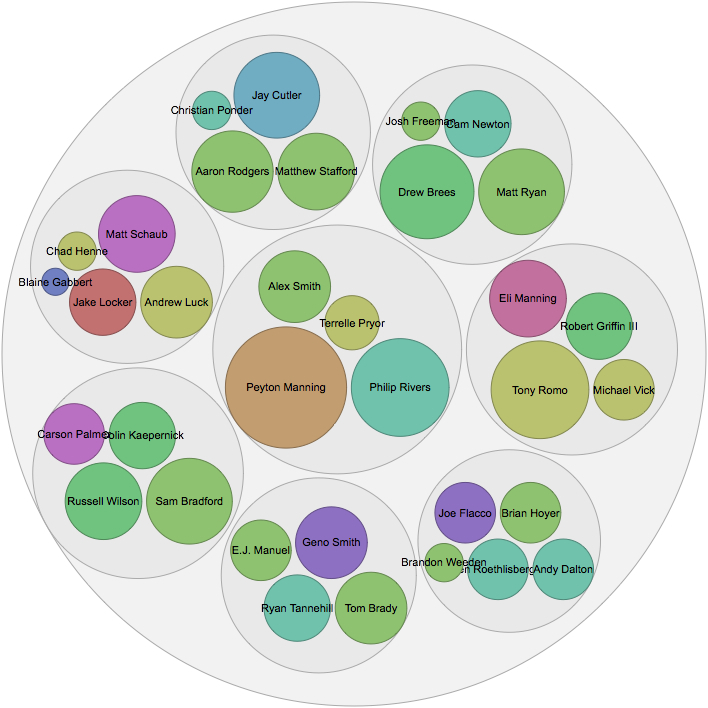 The X axis is passer rating, the Y axis is touchdowns, the colors represent the division the quarterback plays in, and the size of each bubble is proportional to the number of interceptions. Peyton Manning is good; his brother is not (at least this season). In this chart, I organized the bubbles by division, then compared within each one. The size is proportional to touchdowns, while the color is proportional to interceptions (generally speaking, red and brown are excellent, green is really good and purple is bad). I could have used metrics like passer rating or passing yards here, but there are too many distinct numbers all clustered close together, and they’d each get their own color. Finally, for good measure, here’s a non-bubble chart. 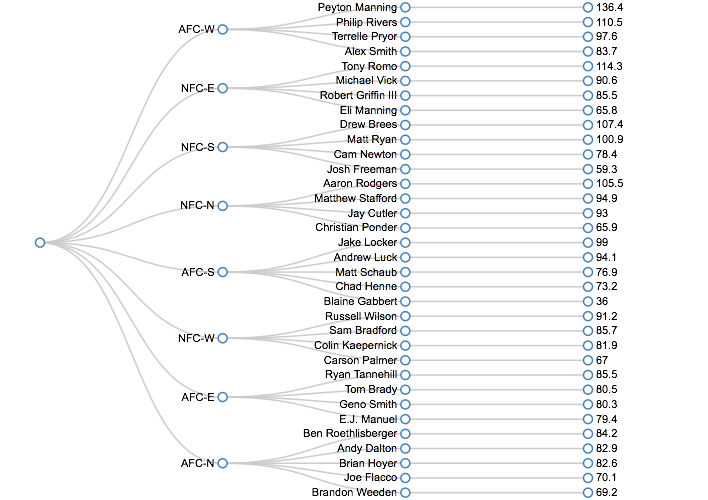 This probably isn’t the ideal use for what’s called a “dendrogram,” but it actually does result in a nice, simple visualization of passer rating broken down by each division. 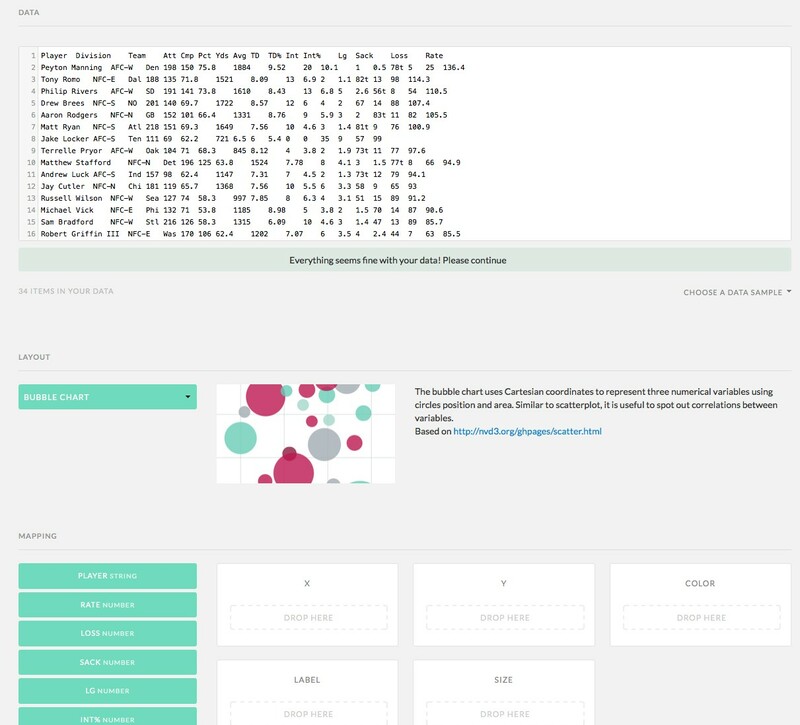 As someone who likes to experiment with datasets I find and incorporate visualizations into stories even though we have about .00001 percent the statistics and visualization budget of a publication like the New York Times, I’m pretty stoked to have another tool in my arsenal. This is almost more confusing than just looking at things on Excel. Maybe because I don’t have too much data to work with? 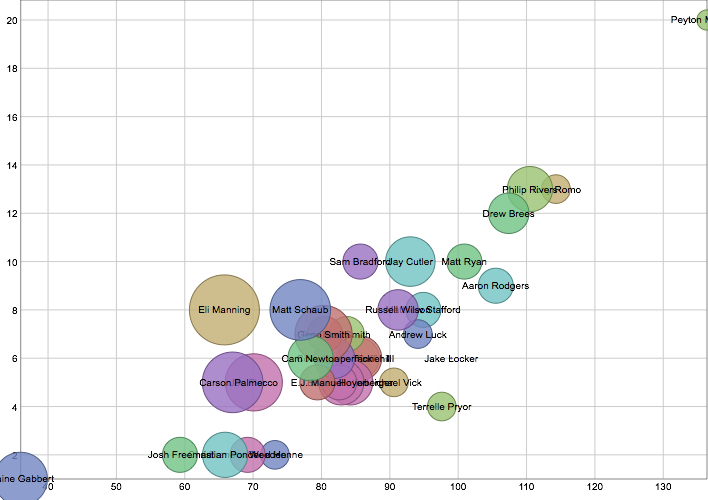 Nifty… although Blaine Gabbert’s dot is too big. Trust me, I’m a Jags fan. LOL from a fellow Jags fan! Reblogged this on NY Italian Diva living in the suburbs of Long Island.